A Cellophane Sleeve is perfect for artistic professionals wrapping their work. And these ones are pink. Pretty AND protective. Cellophane Sleeve Envelopes are highly recommended for conservation purposes. They are of archival quality as well as acid free. This is important because it means the envelopes won’t deteriorate and will stay preserved. Present professional photographs or handmade crafts in the most appealing style: these sleeves are available in beautiful solid pink, fiber mauve, and light red. For packaging that compliments your hard work. Pink Cello Sleeves are USPS approved so they can be mailed out to clients. They also have a self-adhesive closure for easy sealing. 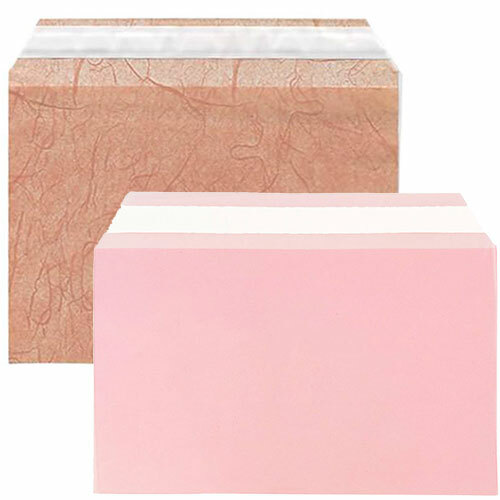 We offer Pink Cello Sleeves in a range of sizes so your material can fit perfectly. No need to cut down or have smaller items swimming in a huge envelope.